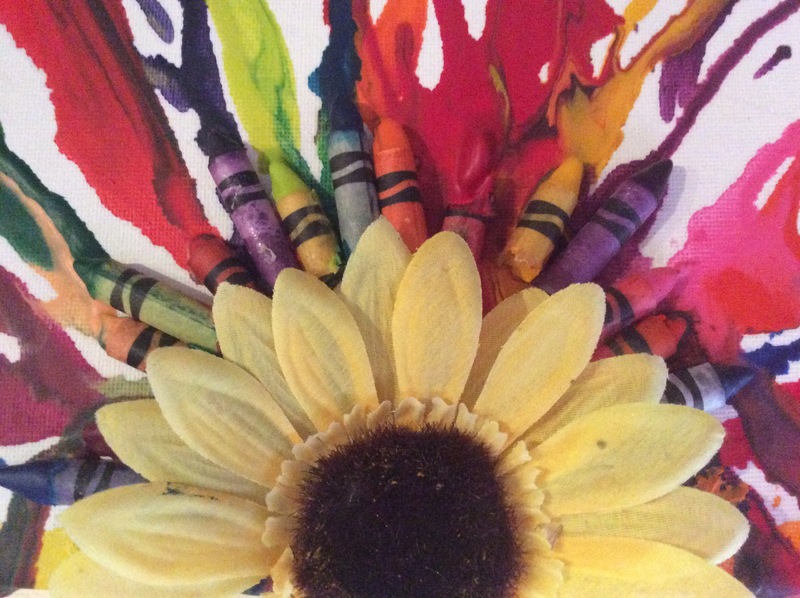 Melting crayon art is not just for older children. With support even toddlers will be able to produce fun pictures and they will also learn a little about melting and colour mixing. A Small, light hairdryer, a canvas board and a few crayons are all that is needed. I’ve found that keeping the paper on the crayons and sticking them to the board makes the job much more manageable for Tinies. Then they, and you, can concentrate on the important part – the melting. Cellotape or glue can be used to secure the crayons. Make sure surfaces are protected! It can be messy! The idea is to keep the hairdryer pointing downwards onto the crayon. Tilt the board slightly. When the crayon first starts to melt it sprays a little in all directions and then will start to trickle downwards . Once there is a stream of each colour then the fun begins! The board can be tilted in different directions so causing the colour streams to cross and mix. Once the child is familiar with the technique it’s fun to experiment. Obstacles can be stuck on the board to send the melted crayon in different directions or a picture can be painted on the hoard beforehand so the melted crayon looks like a fountain or fire or volcano. 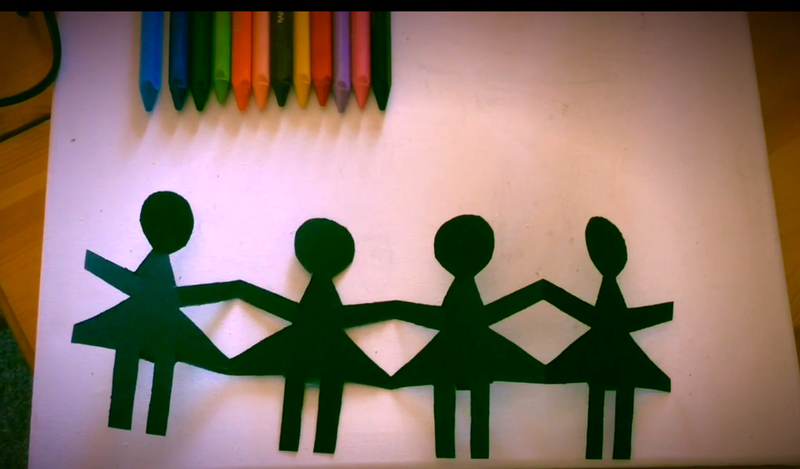 Above: a card cut out can be glued to the board so the crayon covers the cutout making it look like the little people are under a multicoloured fountain. Less is best! Children usually want to keep going and going until all the crayon has melted and mixed. The result? Usually a muddy mess! Should you stop them? No! We know that mixing too many colours together makes well, a pretty yuck colour. They don’t! It’s much better for them to find out themselves. This is the way they learn. What you can do is to suggest taking photos at different stages and then discussing them later. Which did they like best? Which colours worked best? How would they change what they did? Would using fewer colours be best! With a toddler I would suggest using very small. Rayons or break longer ones in half. That way the melting time is halved and the mess! 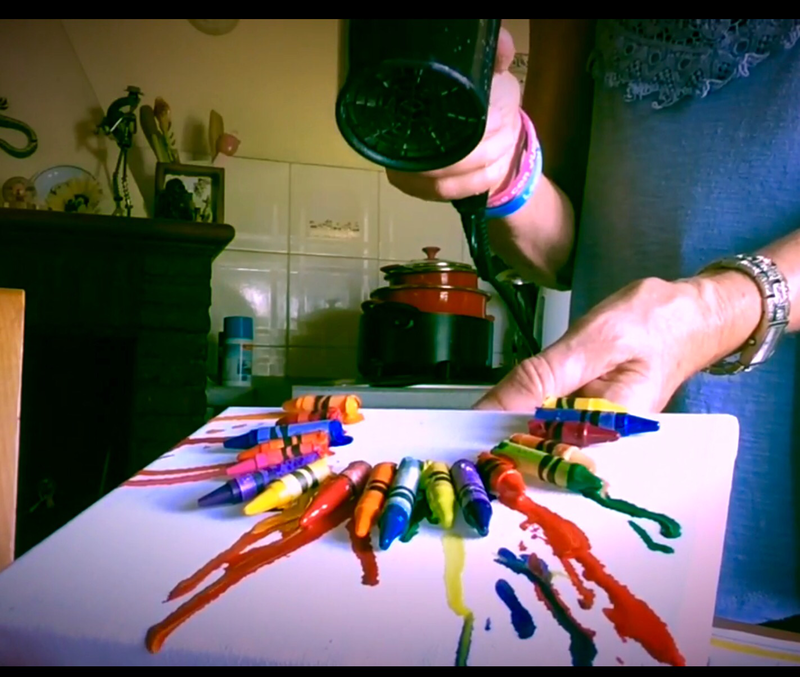 The video below is a fun introduction for very young children to crayon melting. 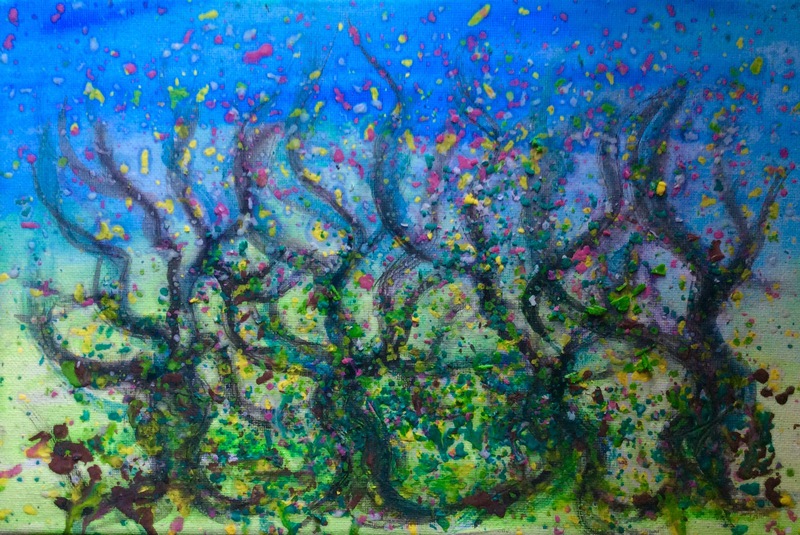 Another fun way with crayon melts. This works well with a simple black or grey painting or drawing on canvas. Here we’ve used trees. Grate the choice of crayons onto newspaper. Place the canvas picture (face side down) on top of the crayons. Then blow hot air at the underside of the canvas.